In Film News this week we’ve got four stories from Cinema Blend. 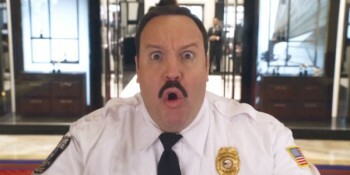 First is some hilarious news out of Russia about the horribly received sequel to Paul Blart Mall Cop. The film that no one particularly wanted and which to most reviewers seemed to be a thinly veiled attempt to send Kevin James on a vacation to vegas has been banned from Russian theatres! No word yet on why but maybe this is the moment when Russia finally becomes a leader in human rights. Also we have early buzz about the Jared Leto portrayal of The Joker in Suicide Squad. Leto seems to be pulling a Ledger to try and surpass Ledger, staying in character even after the cameras stop rolling. The rumours swirling around Suicide Squad indicate that Leto’s joker is going to be –quote- “more cerebral and comedic” – end quote than past iterations. The big question mark though is what the heck the Suicide Squad is going to be doing for this universe given that it is taking place in the same universe as Man of Steel and Batman vs. Superman. In hopeful news there has been a casting announcement about the long attempted re-make of the 1958 sci-fi classic, The Blob. Samuel L. Jackson is reportedly connected to this remake of the classic horror film and it looks like we might be getting some more of Snakes on a Plane Jackson which is alright with me. No news yet on details of the remake except for Jackson’s casting and Simon West being pegged as director. Simon West was previously of Con Air, Lara Craft: Tomb Raider, The Expendables 2, and Wild Card. Finally is some damning criticism about one of last year’s most disappointing movies, Rupert Wyatt’s The Gambler. James Toback, writer of the original 1974 version of The Gambler starring James Caan had some harsh words for the new film, in particular for its writer, Oscar winner William Monahan. Aside from the film just not being as fun as the original, he criticized the remake for misunderstanding compulsive gambling and how psychologically attractive and devastating it is. It’s particularly personal for Toback because the original film was partially autobiographical for him so its understandable that he’s a little miffed. Onto the Box Office for this weekend. Avengers: Age of Ultron is going into its 3rd weekend and by golly if it stays in the top two this week it is only by the grace of god. After dominating the Reese Witherspoon flop Hot Pursuit last weekend to the tune of 77 million dollars, this weekend if it makes 30 million it would be lucky. Opening today are two highly anticipated sequels, Mad Max: Fury Road and Pitch Perfect 2. Looking at it on paper these wouldn’t ordinarily be a threat to a film like Age of Ultron (even in its 3rd weekend), but the internet truly has changed things. The first Pitch Perfect was a box-office success, easily making back its budget. But it really took hold on social media and is the closest thing this generation of students has to Mean Girls in terms of online presence. Its getting positive reviews from critics, sitting at 70% on the tomatometer with the consensus saying that its not quite as good as the original but that audiences will be pleased. It will do incredibly well at the Box Office this week, and I’m predicting it’ll just beat out the other powerhouse this weekend – Mad Max: Fury Road. Another sequel but this time from a series that hasn’t had an instalment in 30 years. However, here the director of all three original Mad Max films is back for the fourth instalment and its starring Tom Hardy, Charlize Theron, and Nicholas Hoult. The film is getting rave reviews from critics, up at 99% on the tomatometer and being hailed as the best film in the series. The industry predictions are that both films will do a little over 40 million this weekend and I’m inclined to agree. Pitch Perfect has the momentum from its fan base and Mad Max has the buzz to make both some of the most successful films of the summer. Remember to check out the full show every Friday at 2pm.